Whether your family is in the market for a compact, easy to store table or a full size pool or bumper pool table, at familypoolfun we have something that is just right for your family’s style, taste and budget. Our new lineup of mini tabletop games include a 40” air hockey unit with catchy graphics and rugged construction with protective cushions and a 40” tabletop pool table complete with 36 inch cues, billiard balls and a racking triangle. The size of these units make them perfect for setting up in a child’s bedroom, in a living room during parties, or family fun night--while still allowing for quick clean up and store-away when more room is needed. Air hockey has been around since 1969 but never before has it been so popular or universally played. New this season are three different models from Carmelli designed to fit perfectly into your life. The Hat Trick 4’ Air Hockey Table offers big table features at a starter unit cost. The 110V electric blower ensures steady game play and the plastic scoring system keeps track of the action. The Face-Off 5‘ Air Hockey Table features electronic scoring, awesome graphics and rock solid construction with environmentally safe materials withstand the toughest of shots and gameplay. Independent leg levelers make for fast and easy table leveling on any room’s floor. The Premium 7 1/2’ Table with electronic scoring offers a clean sleek look and delivers a top-of-the-line air hockey experience. With a high gloss surface and two blowers, the game action cannot get any better. And don’t forget to pick up some extra striker and puck sets to make sure everyone can join in on the fun. Few table games offer the speed, excitement and hand-eye coordination required by foosball. 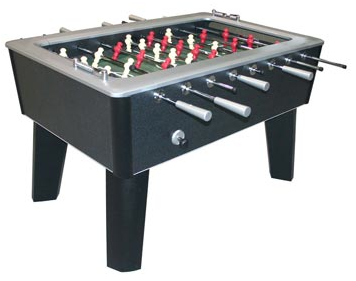 A great game with two, four or even six players, foosball (or soccer) tables are guaranteed to deliver serious competition and fun. The 48” Playoff Foosball Table offers great new graphics, a solid build with certified environmentally safe materials and a smooth life-like grass playing surface. A manual scoring system makes keeping track of game progress simple. The 54” MLS Defender Soccer Table is a close to playing Major League Soccer as you can get without donning a pair of cleats. The soccer balls glide smoothly over the painted grass playing field and the four thick table legs are easily adjusted to level to the most uneven flooring. The three goalie configuration adds to the fun while the abacus scoring system keeps track of the official MLS-style footballs that pass through the goal. The Primo 56” Table is a premium table with 1” cabinets, a beautiful dark finish and four cup holders. Steel rods deliver sturdy game play and smooth shot making while perfectly balanced ABS players offer to compete for you. six foot 3-in-1 Flip Table that features billiards, air hockey and table tennis --- all in one table! Easy latch and lock construction makes flipping and game changing a snap, and this model ships with all the necessary accessories to get your game on. None of these gaming options fit your need or desire? Well, you don’t have to board a cruise ship to get a cruise ship-like experience when you choose the NAPA Premium12’ Shuffleboard with Overhead Electronic Scoring. The playing surface is 3” thick North American hardwood and is accented with a beautiful furniture finish that looks great in any room. The electronic scoreboard brings high quality gaming to life in your own home. But if a traditional billiards game is what you’re looking for, check out the new pool and bumper pool table models from Carmelli. Whether you select the seven or eight foot pool table, you’ll get great style and quality plus rugged construction that ensures your table will last for years to come. The Bumper Pool Table features a sturdy 3/4” wood playing surface with 2” rubber bumpers for great game action. This table screams value and includes two 48” cues, 10 bumper pool balls, a table brush and chalk.